July 14, 2010 By Paul Mayer & filed under Buying Advice, Product Review. Tool reviews are often written based upon an experience with a brand new tool just pulled out of the box. In this case, however, I am writing about a tool that has been put through some extreme paces for about a year, as my father and I use it extensively in his woodworking business. You have also seen this sander in action here on WWGOA as well, as we built a wine bottle holder and a spatula in earlier projects.The Ridgid EB4424, $199, serves as an oscillating spindle sander, and with a quick changeover, doubles as an oscillating edge belt sander. This is the only tool that I am aware of that offers both functions. Decent spindle sanders start at about $150, and oscillating belt sanders don’t even exist in the hobbyist market aside from this one (industrial versions start at over $900), so needless to say I was skeptical that this product would deliver any respectable level of performance or durability for $199. The package includes everything you need to get started, including abrasives for both belt and spindle sanding operations. Setup is straightforward and quick; pop the padded feet on, attach either the spindle or belt mechanism with your choice of abrasive, and you are all set. Belt sanding assembly. The sanding belt assembly features a simple design and solid construction. The belts are a standard 4 x 24″, making it easy to find and afford replacement abrasives. The oscillating action makes this design unique in its class. Spindle sanding gear. The sanding drums and sanding sleeves for spindle sanding operations are high quality as well. Drum and sanding sleeve sizes include 3/4″, 1″, 1-1/2″, and 2″. The kit also includes a 1/2″ sanding sleeve which can be installed directly onto the machine’s spindle, without use of a rubber drum. Ready to go right out of the box. My initial impression was that, at roughly 40 pounds, this machine is substantial for a bench top unit. I like some mass in a machine of this nature because the weight provides stability which enables better performance. Everything seemed to be of high quality; solid with impressive fit and finish. I checked to ensure that the sanding belt was square to the table, and it was perfect. I also checked a spindle, which was also square to the table. When to spindle and when to belt? Roughly 98% of the time, I leave this tool set up as an edge belt sander. The flexibility provided by this unique design is truly remarkable. First, the unique tapered design essentially provides three different sanding capabilities in one. On each end, you have the equivalent of a sanding drum or spindle. On one end a large radius spindle of 3″, and on the other end a smaller spindle of 1-1/2″. Then, the flat portion of the assembly allows sanding of flat or convex curved surfaces. Plus, by having the belt oscillate in the same fashion as the spindle sander, it reduces the sanding marks left behind yielding a surface that requires much less additional work compared to non oscillating edge sanders. This is a tremendous innovation for the hobbyist market. Spindle sanding. The only time I experience the need to switch to the true spindle sanding implements is for extremely tight curves, requiring one of the smaller spindles, or for sanding an enclosed area that is too small for the belt. POWER, POWER, POWER! For a tool at this price point, I was thoroughly impressed by the performance. The machine delivers chatter free performance, and powers through stock at a voracious clip. Large work surface. 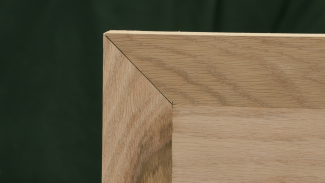 A generous 19″ x 24″ work surface provides sufficient support as you guide material past the sanding elements. 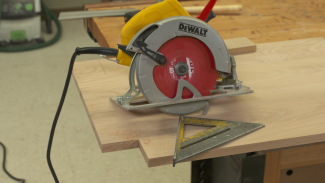 While amply large, but at the same time does not consume an unfair portion of bench space, which suggests a thoughtful design for a bench top tool. Quality. Everything about this machine (except for the table finish described below) is of extremely high quality. After a year of heavy use, nothing has broken or worn excessively. Everything still feels solid and operates smoothly. On board storage. Everything that you need for this tool, including all sanding implements for both belt and spindle operations, are stored neatly on the tool itself in a clever design. That means nothing gets relegated to the shop “junk drawer”, which is effectively the same as throwing something away, because sometimes I think it may be faster to just order a new part on-line than try to find something in there. Effective tracking adjustment. I found the tracking adjustment on the belt sander to work quite well. It was straightforward to get the tracking dialed in so that the belt rode where it was supposed to, and once it is set it rarely needs to be tweaked until a belt is changed. This works much more reliably than the tracking adjustments on my hand held belt sanders. Dust extraction. In general, oscillating sanders produce a large volume of dust which is challenging to capture. The dust collection on this unit is quite effective when coupled with an adequate shop vacuum or dust collector, and superior to the dust collection capabilities of most spindle or edge belt sanders. Quick change artist. I was impressed at how quick and intuitive the process is to change the tool over from a spindle sander to an edge belt sander. The changeover requires no tools. You simply remove a single knob, swap the belt assembly for a sanding drum or vice versa, and you are back in business. Kudus to the Ridgid design team on this. The only way that a multi-purpose tool can earn a footprint in my shop is for the changeover process to be quick and hassle-free, and this one hits the mark. Tilting table. 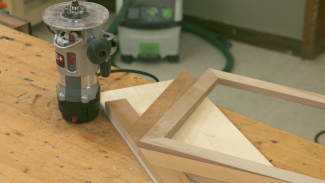 The table tilts from 0-48 degrees to provide accurate sanding on tapered edge cuts, with convenience stops for common angles at 0, 15, 22.5, 30, and 45 degrees. Downsides. Poor table finish. After a year of regular use, the finish on the table has worn through badly. The finish is not of a grade suitable for an item that receives this much wear, and is inconsistent with the high quality of all other aspects of this tool. I imagine that a regular application of paste wax would probably help to minimize the wear, but I don’t do this, as the wear doesn’t really disrupt my serenity that much. Chintzy spindle sanding insert. Part of the process of changing over from belt sanding to spindle sanding requires the installation of an insert to cover the opening left when the sanding belt assembly is removed and replaced with the smaller spindle sanding drum. The concept is simple, and the insert does the job, but it is made of lightweight plastic and I am concerned that this highly exposed item will wear or crack over time. Since I use this tool almost exclusively as an edge belt sander, the insert rarely gets used in my shop, so it will probably not be an issue for me. But if I frequently changed from belt sanding to spindle sanding, or performed spindle sanding extensively, I would be apprehensive about this component. Recommendations. Ridgid must have a team of highly effective intellectual property attorneys, or this tool would be copied by every tool manufacturer in the industry. In general I am not a fan of multi-purpose tools, but I have been delighted with this tool. While I mainly use it as an edge belt sander, it is a snap to changeover for spindle sanding operations, and works equally well in that mode. This tool is ideal for removing marks left behind by power cutting tools, particularly the band saw or jig saw. It offers plenty of muscle for the hobbyist or small professional shop, and the innovative design makes this tool a bargain at $199. One additional suggestion; this machine generates a lot of dust quickly, as it should, so be sure to configure adequate dust collection at the source to minimize the negative effects on your health and your tools. Hi Vinny. I was not aware of this. I would think that the manufacturer would replenish parts for this since the tool is still in production, but I do not know what the future holds for this part. Thank you for bringing this to my attention. I have just purchased this sander. I am very upset that I now find that the mitre Square is no longer available. How can Ridgid sell a product and not provide the accessories that go with it? Very disappointing. 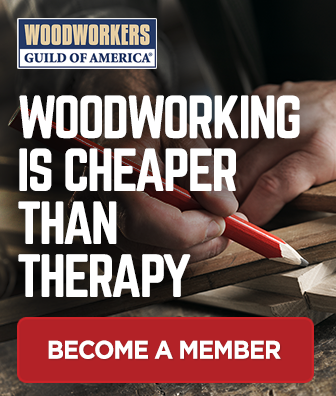 If you have a few basic beginner woodworking tips, you are well on your way to becoming the woodworker you want to be. Remember, it will take some time to get there, but with a little patience and dedication, you can become the skilled woodworker that you have always dreamed of.